The Fair Employment is an equal opportunity law poster by the Pennsylvania Department Of Labor & Industry. This is a mandatory posting for all employers in Pennsylvania, and businesses who fail to comply may be subject to fines or sanctions. This poster must be posted in a conspicuous place where all employees can see it. This poster discusses the rights that potential employees have to not be discriminated against, how potential employees can file a complaint if they feel discriminated against and where to get further information on this issue. It appears you don't have a PDF plugin for this browser. 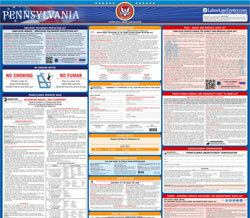 Please see the link below to download pennsylvania-fair-employment.pdf. rights to compensation, tenure and other terms, conditions and privileges of employment. 2. Deny membership rights and privileges in any labor organization. 3. Deny any person equal opportunity to be referred for employment. the Bureau of Professional and Occupational Affairs. proceeding, or for any person to aid or abet any unlawful discriminatory practice under the Human Relations Act. persons, including units of state and local government, (2) Labor organizations, and (3) Employment agencies. personal residence of the employer, (3) Any individual employed by his or her parents, spouse or child. frequented by applicants, employees or members. Crimes Code and may subject you to fine or imprisonment.